Junior Holly Spencer runs to catch the football for a touchdown against the freshmen. 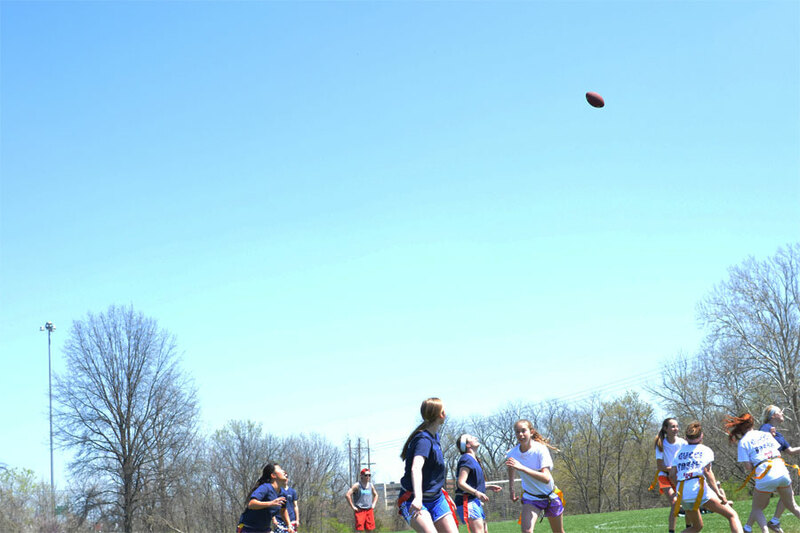 Students showed up at Leawood City Park Friday morning to participate in the Powderpuff and Old Spice games. The boys would compete in a series of volleyball games while the girls challenged each other in flag football. After a long day of volleyball, flag football, and hotdogs, the seniors walked away having won both the volleyball and flag football tournament. The first game to take place was the freshman vs. junior boys volleyball game. The freshman and junior girls gathered along the sides to cheer on their grades. Freshman Wyatt Palmer served the ball over the net. Junior Turner Jones responded right away, hitting the ball into the air into a position where junior J.T. Trott could hit it back over the net. This is just one of the many plays performed by both teams. Although the freshman put up a good fight, the junior boys took game one. During the sophomore and senior volleyball game, the sophomore and senior girls crowded the sidelines to cheer on their teams. Some of the senior girls led cheers for the boys and ended the game by storming the court after the senior’s victory. The championship game between the seniors and juniors ended with the senior girls running onto the court to congratulate their senior boys on the win. After a lunch of hot dogs and chips, it was time to begin the flag football games. The first teams to play were the freshmen and junior girls. Warmed up from their pre-game workout, the freshmen took the field. After a long game, the junior girls took away the victory and would soon play the seniors, who had beaten the sophomores in a previous game. The final game between the juniors and seniors was head and head. Both teams were focused and ready, hoping to be the champions. The juniors attributed their skill to their coaches and teamwork. “We had really good coaches, and I think our team worked together really well,” junior Caroline Nichols said. With the score nearly tied most of the game, junior Jenny Jenkins scored a point that put the juniors ahead. 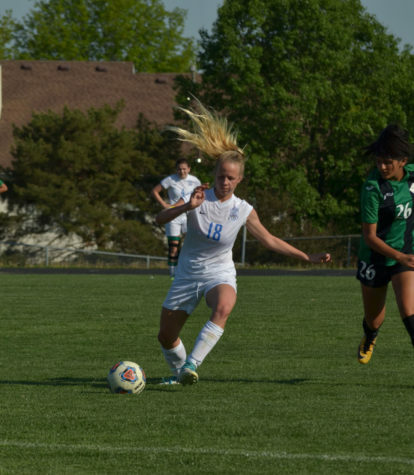 In response, senior Keana Ko scored one for the seniors. After going back and forth, the seniors were winning by the time science teacher and referee Brad Belden called the game, leaving the seniors with both Old Spice and Powderpuff victories.